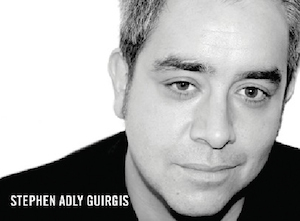 The Harold and Mimi Steinberg Charitable Trust is presenting Stephen Adly Guirgis with the Steinberg Distinguished Playwright Award at the Seventh Annual Steinberg Playwright “Mimi” Awards, on Monday, November 17, 2014 at Lincoln Center Theater. Guirgis will receive a cash award of $200,000 and “The Mimi,” a statuette designed by Tony Award-nominated scenic designer and architect David Rockwell. The evening will feature opening remarks by Kwame Kwei-Armah, Artistic Director, CENTERSTAGE, followed by readings of Guirgis’ work. Yul Vázquez and Felix Solis will perform a scene from The Motherf***er with the Hat; Ellen Burstyn and Kevin Corrigan will read an excerpt from The Little Flower of East Orange; and Elizabeth Rodriguez will round out the performances of Guirgis’ past work with a monologue from The Last Days of Judas Iscariot. The evening will also feature a special premiere reading from a new piece by Guirgis, performed by Stephen McKinley Henderson, Ron Cephas Jonesand Neil Tyrone Pritchard. Liza Colón-Zayas will introduce Guirgis prior to the presentation of the award by Michael Steinberg of The Harold & Mimi Steinberg Charitable Trust, followed by a few words from Guirgis himself. The Mimi Awards promote theater as a vital part of our culture by nurturing American playwrights and encouraging the development and production of new American plays. 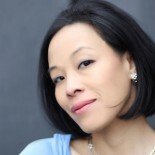 The Steinberg Distinguished Playwright Award is presented biennially to honor and encourage the artistic excellence and achievement of an American playwright whose body of work has made significant contributions to the American theater. 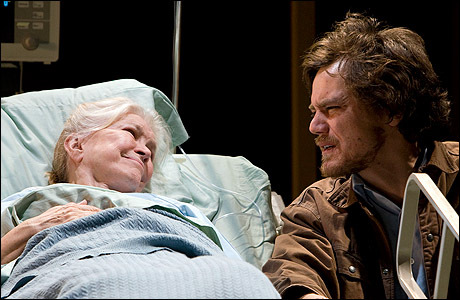 Ellen Burstyn and Michael Shannon in The Little Flower of East Orange. 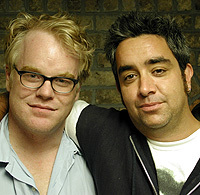 Philip Seymour Hoffman and Stephen Adly Guirgis. 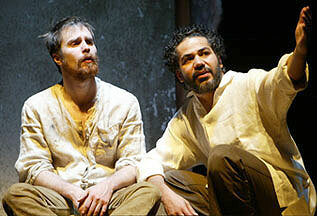 Guirgis is a member and former co artistic director of LAByrinth Theater Company. His plays have been produced on five continents and throughout the United States. They include: Our Lady of 121st Street (Drama Desk, Lucille Lortel, Outer Critics Circle Best Play Nominations), Jesus Hopped the ‘A’ Train (Edinburgh Festival Fringe First Award, Barrymore Award, Olivier Nomination for London’s Best New Play), In Arabia, We’d All Be Kings (2007 LA Drama Critics Best Play, Best Writing Award), The Last Days of Judas Iscariot (10 Best Time Magazine and Entertainment Weekly) and The Little Flower of East Orange, with Ellen Burstyn and Michael Shannon. All five plays were directed by Philip Seymour Hoffman and were originally produced by LAByrinth. 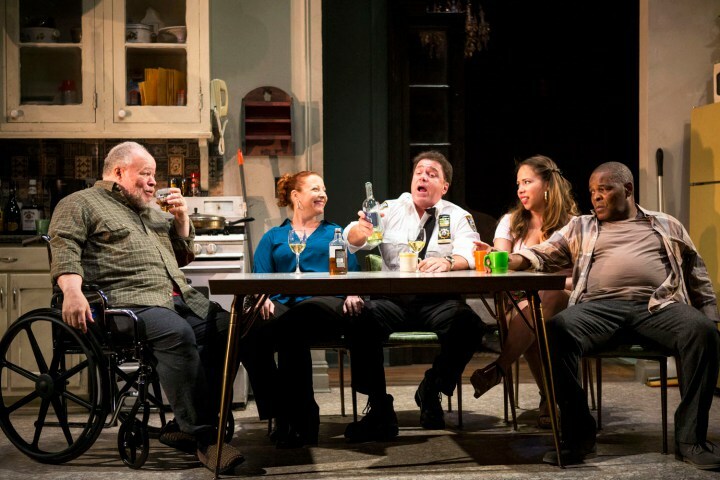 His most recent play, Between Riverside and Crazy recently completed a sold out run at The Atlantic Theater Company and will transfer to Second Stage Theatre in 2015. 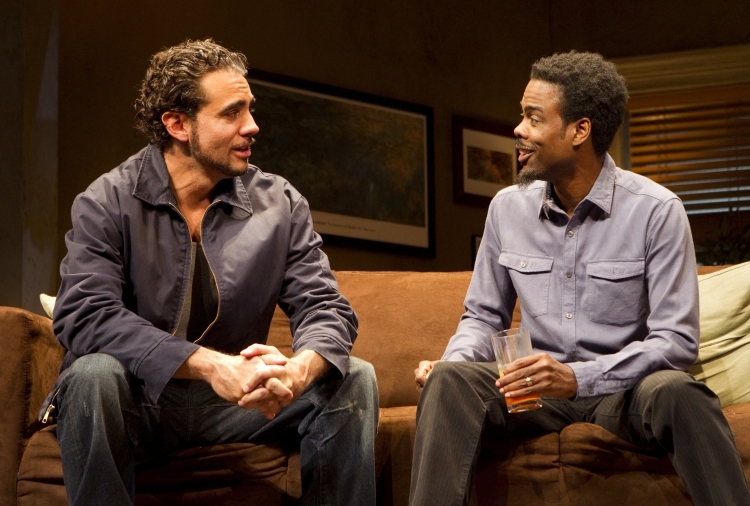 His 2011 play, The Motherf***er with the Hat was directed by Anna D. Shapiro and marked his third consecutive world premiere co-production with The Public Theater and LAByrinth. In London, his plays have premiered at The Donmar Warehouse, The Almeida, The Hampstead and at The Arts Theater in the West End. 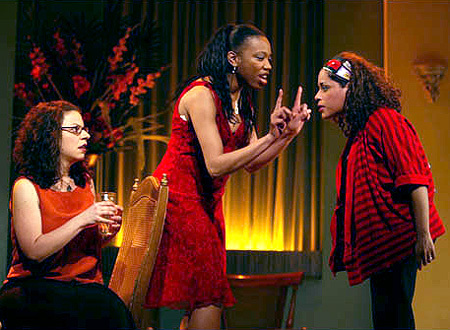 Other plays include Den of Thieves and Dominica The Fat Ugly Ho for the 2006 E.S.T. Marathon. He has received the Yale Wyndham-Campbell Prize, a PEN/Laura Pels Award, a Whiting Award and a TCG fellowship. He is also a New Dramatists Alumnae and a member of MCC’s Playwright’s Coalition, The Ojai Playwrights Festival, New River Dramatists and LAByrinth Theater Company. These playwrights were each presented with a monetary award along with “The Mimi,” a statuette designed by Tony Award-nominated scenic designer and architect David Rockwell. In 2008, the Board of Directors of the Steinberg Trust created an Advisory Committee of prominent theater professionals to establish the awards criteria, nominate individual candidates and select each recipient. The 2014 Advisory Committee is comprised of Jeremy Cohen, Producing Artistic Director, The Playwrights’ Center; Paige Evans, Artistic Director, LCT3; Kwame Kwei-Armah, Artistic Director, CENTERSTAGE; Neil Pepe, Artistic Director, Atlantic Theater Company; Bill Rauch, Artistic Director, Oregon Shakespeare Festival; Carole Rothman, Artistic Director, Second Stage Theatre; and Chay Yew, Artistic Director, Victory Gardens Theater. The members of the Board of Directors of The Harold and Mimi Steinberg Charitable Trust are Carole A. Krumland, James D. Steinberg, Michael A. Steinberg, Seth M. Weingarten and William D. Zabel. 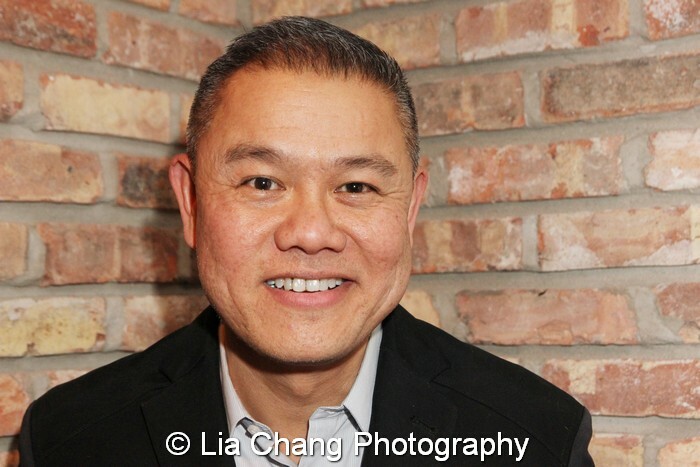 This entry was posted on November 11, 2014 by Lia Chang in Awards, Entertainment, Events, New York, Theater and tagged 2014 Steinberg Distinguished Playwright Award, Anna D. Shapiro, Annie Baker, Atlantic Theater Company, Backstage Pass with Lia Chang, Between Riverside and Crazy, Bill Rauch, Bruce Norris, Carole Rothman, CENTERSTAGE; Neil Pepe, Chay Yew, David Adjmi, David Henry Hwang, Den of Thieves, Dominica The Fat Ugly Ho, Ellen Burstyn, In Arabia We’d All Be Kings, Jeremy Cohen, Jesus Hopped the ‘A’ Train, Labyrinth, Labyrinth Theater Company, LCT3; Kwame Kwei-Armah, Lia Chang, Lincoln Center Theater, Lisa D’Amour, Lynn Nottage, MCC’s Playwright’s Coalition, Melissa James Gibson, Michael Shannon, Mimi Steinberg, Mimi Steinberg Charitable Trust, New Dramatists Alumnae, New River Dramatists, Oregon Shakespeare Festival, Our Lady of 121st Street, Paige Evans, PEN/Laura Pels Award, Philip Seymour Hoffman, Rajiv Joseph, Second Stage Theatre, Seventh Annual Steinberg Playwright “Mimi” Awards, Steinberg Distinguished Playwright Award, Steinberg Distinguished Playwright, Stephen Adly Guirgis, Tarell Alvin McCraney, TCG fellowship, The Atlantic Theater Company, The Harold and Mimi Steinberg Charitable Trust, The Last Days of Judas Iscariot, The Little Flower of East Orange, The Motherf***er with the Hat, The Ojai Playwrights Festival, The Playwrights’ Center, Tony Kushner, Victory Gardens Theater, Whiting Award, Yale Wyndham-Campbell Prize.